CHARLESTON, WV – State revenue collections are continuing to surge forward and on Tuesday Gov. Jim Justice reported that the movement is nothing short of incredible news for West Virginia. “It is unbelievable what is happening, and it’s happening right now. It’s happening in West Virginia today,” Gov. Justice said. Gov. Justice reported that the FY 2018 surplus of $36 million is the first time the state has finished a fiscal year in the black, without a budget cut, since 2012 and that the state set an all-time high for General Revenue Fund Collections with $4.245 billion. The previous record was $4.196 billion in FY 2015. “This is incredible,” Gov. Justice said. Gov. Justice added that the country and the world are now looking at West Virginia in a different light. He also credited the work of West Virginia’s elected Republican legislators and President Donald J. Trump’s tax reform efforts as key parts of the economic revitalization that is occurring in the state. Revenue Secretary Dave Hardy called Tuesday’s report both record-setting and a sign of things to come. 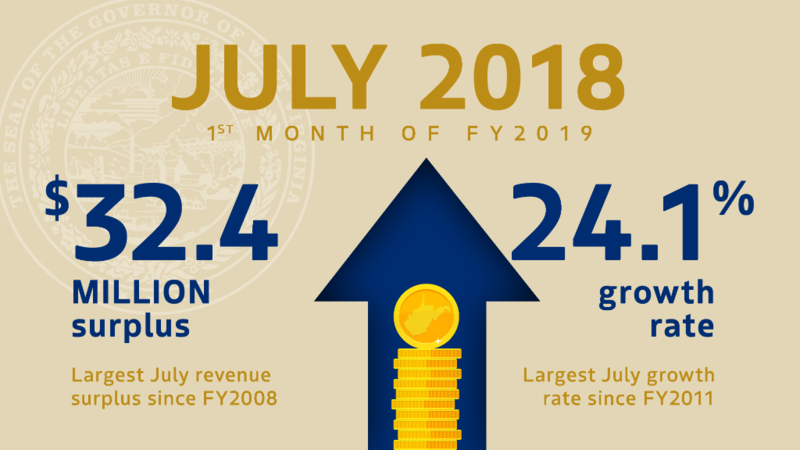 July General Revenue Fund collections of $313.6 million were nearly $32.4 million above estimate and 24.1% above prior year receipts. 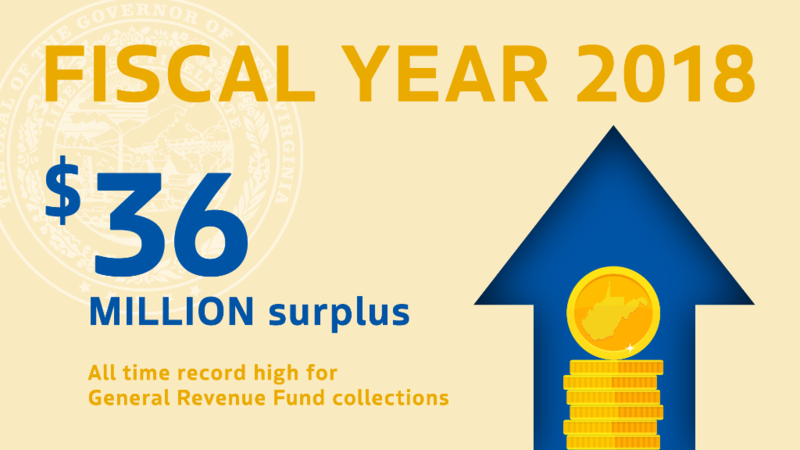 The increase from prior year receipts was attributable to a $21.8 million increase in monthly Consumer Sales tax collections, a $17.3 million increase in monthly Personal Income Tax collections and a $16.1 million increase in Severance Tax collections. These three revenue sources accounted for nearly 91% of the $60.8 million increase in collections from the prior year and for nearly all of the surplus over estimates. Personal Income Tax collections of $145.5 million were $10.1 million above estimate and 13.5% above of prior year receipts. The gain in net revenue from the prior year was due to higher than expected withholding tax receipts. Income withholding tax payments of $141.0 million were 13.2% above prior year receipts and reflect a combination of improving wage and employment growth. Withholding tax collections previously grew by 9.1% during the final three months of FY2018. Data from the WorkForce WV June employment report show private sector employment growth of 1.0% over the prior year with nearly 58% of the job growth concentrated in the goods producing sectors. Consumer Sales and Use Tax collections of $87.1 million were nearly $8.9 million above estimate and 33.4% above prior year receipts.Overall collection growth, including transfers to special revenue funds, was a robust 13.3% for the month. The greater rate of growth in General Revenue Fund collections over the prior year was partially attributable to a prior year $11.3 million revenue transfer to the State Road Fund. Recently enacted legislation replaced this source of previously dedicated General Revenue with higher State Road Fund fees from other sources. Due to growth in municipal participation in the local sales tax program, the quarterly local tax distribution totaled roughly $21.0 million, an increase of 15.7% over the prior year. After rising at a more modest clip of roughly 2% during most of last year, sales tax collections rose at much higher rates of 7.8% in June and 13.3% in July. General Revenue Fund Severance Tax collections of $12.6 million were $13.5 million above estimate and total severance tax collections for all funds were up by nearly 66%. In addition to deposits in the General Revenue Fund, total collections included the payment of two separate quarterly local coal severance tax distributions totaling $9.3 million. The quarterly distributions were 4.1% lower than payments made during the same quarter in the prior fiscal year. In addition to both the General Revenue Fund and local tax revenues, another $20.6 million in severance tax collections was deposited in the Infrastructure Bond Fund during the month. Total net State and local severance tax collections for the month were roughly $42.5 million. Collections exceeded prior year receipts by nearly 66%. A portion of the gains were associated with revenue timing alterations. The 66% gain in July followed a 24.8% decline in the prior month of June. Collection growth for the combined months of June and July was a more modest 7.2%. Tobacco Products collections totaled $13.6 million in July. July receipts fell short of estimate by $2.3 million and prior year collections by 20%. Collections continue to trend lower partially due to product substitution away from traditional tobacco products toward e-cigarettes and other alternatives. Business and Occupation Tax collections of nearly $10.2 million were roughly $1.1 million above estimate and 13.6% ahead of prior year receipts. Insurance Premium Tax collections of nearly $28.8 million were $1.2 million above estimate and 7.4% ahead of last year due to higher insurance premiums in a growing economy. July is not a major collection month for the Corporation Net Income Tax. However, net receipts of $4.0 million were nearly $0.8 million below estimate, but still 11.1% above prior year receipts. Gross collections were nearly 8.8% lower this year with net growth in revenue attributable to a $1 million decrease in tax refund payments. Except for the $2.3 million shortfall in Tobacco Tax collections, most other revenue sources were either above estimate or just slightly below estimate for the month of July. Total State Road Fund collections of nearly $146.5 were $57.2 million above estimate and 16% above prior year receipts in July. The increase in tax collections from the prior year was led by a timing related 45.4% rise in Motor Fuel Excise Tax collections that included a larger than expected carryover from June of last fiscal year to this year. Fuel tax collections exceeded the monthly estimate by nearly $20.3 million. In addition, registration and license fees collections were up by nearly 24% and above estimate by nearly $3.5 million. Motor Vehicle Sales Tax collections were up by nearly 29% from the prior year and above estimate by $4.2 million. Federal reimbursements were up 17.2% to more than $44.1 million.